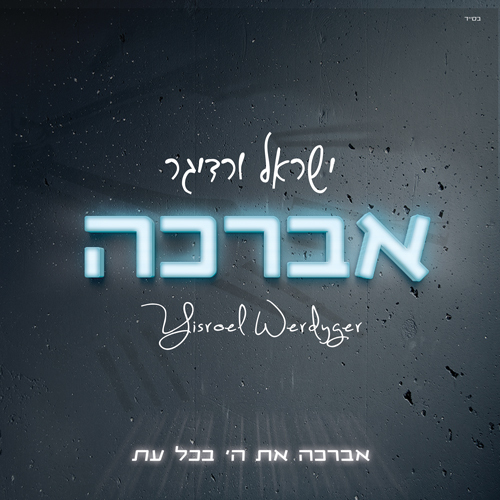 Once again I have been given the opportunity to write a review for an album released by Yisroel Werdyger. This is a momentous occasion because I have been looking forward very much for Sruly to release a new album just so I can get the feeling that I can write about an exceptional human being – not just a great singer. He sings with hartz and warmth and I know first hand that it is authentic feelings flowing from his soul. Once again Sruly hired the best producer – Gershi Moskowitz. The vocal recording was produced by Yossi Tyberg and the music was arranged and produced by Shua Fried. To really get the most out of the album, pay close attention to the selection of words for each song. Most are either praising Hashem or a deep bakasha/prayer. Many are from zmiros. The album starts off with a nice piece from Hallel. The speed is mid-level – not really fast, but with a really nice high part that comes across with power. This song has more jam to it. The words are from Friday night zmiros with words that mean spreading out my hands when I open my mouth to say Nishmas. There is one word to describe this emotion – “tziflakert”. This one is not a Skverer nigun, but rather composed specially for this album. It is a great leibedike tune and it reminds me of the hit “Ahallelo Lailoikai” which I believe was also composed by the same composer as it is a Skverer nigun. This song was originally released by Sruly’s father Mendy Werdyger in his album Zakeinu. It is a gorgeous song, but it never took off in popularity until now. It is a very deep tefilla for hatzlacha with children. It starts off very slow like chazzanus Carlebach style. Then it speeds up to a waltz speed and that really adds to the effect of the song. The children’s choir also gets you more inspiration. Seems like Pinky Weber is Sruly’s favorite composer. This is the title track of the album. The words are from Tehillim that Dovid Hamelech sings that he always praises Hashem. That is the bottom line crux of the theme of this album. The song is similar to the first song Bruchim, just a bit faster. There is also a child soloist here – Sruly’s son. Perhaps no album is complete without at least one composition by Yitzy Waldner! You just don’t know what style to expect from him. I guess that’s a characteristic of a great composer that he is multi-faceted. This is a slow hartzige song beseeching Hashem for rachamim. The words are from Tachanun and are also said by Slichos. You get Sruly doing backup vocals at the 4:06 point and then punching thru with a beautiful solo after that with one final push for mercy. This song is quite unique as it starts off like a waltz and then in the high part transitions into a real emotional shtickel similar to Yaakov Shwekey’s Hiney…loi ro’ov lalechem from his first album Shomati. That was a hit when it came out, but I believe this one is a notch above. That is number 4 for Reb Pinches Weber. However, this is very different as this is a real hartzige slow song. The words are from a tefilla by the Ohr Hachaim Hakodoish that hashem should remember his love for us – his children the nation of Yisroel. This is a special chiddush in tefilla because it emphasizes the concept of “lihishtasheia” that Hashem’s relationship with Klal Yisroel is close and deep like a father to a child to the level of playing with him like a father plays with his baby. Then it adds that we reciprocate that feeling “ki koshe praidoscho mimenu” – that we can’t bear to be separated from him like we feel in Golus. On this we base our tefilla that Hashem should rebuild and restore the Bais Hamikdosh. All I can say is Thank you Pinky for giving this to Sruly to sing because only he is a fit for such a masterpiece especially when he switches to the Yiddish words towards the end. This is quite a leibedike song – maybe sung as a Hora. I really enjoy it. This of course goes with the album’s theme of strong praise for Hashem. At around the 3:20 there is a spunky “Mona style” violin musical piece that transition to guitar that gets you really into it. The shtickel is repeated at the song’s ending. This was composed in honor of a Hachnosas Sefer Torah in the Vizhnitzer Bais Hamedrash. It’s a multi-parter as it starts off like a classical symphony and Sruly starts singing in a style that Yirmiyah Daamen sang on some of his Belzer albums. The song Hayom Haras Oilom from Mimkoimchu comes to mind. However, Sruly goes back to his own sweet style. Then at 2:15 it picks up to waltz-speed then slows down to a hartzige style. Back to chazzanus again then to leibedik. A glorious ending to a fantastic album! You gotta get yourself this geshmake album to keep you going for this long winter.